Flamboyant, visionary, ego- or monomaniacal, tempestuous, alcoholic, and self-destructive—the words approach but do not satisfactorily explain Larry MacPhail. His innovative approach to the game brought about night baseball and baseball on the radio. He was a mover and shaker in the world of Major League baseball until in a fury he catapulted himself right into retirement. MacPhail was a baseball genius. In addition to his pioneering work with baseball and the broadcast media, he had incredible foresight in many other disparate aspects of the game including pension plans, airplane travel, and batting helmets. He had a particular talent for bailing out poor teams in desperate financial straits. With his ability to wheel and deal, he saw opportunities way ahead of other baseball executives. But just when his clubs were making money and winning, he self-destructed. While alienating almost everyone around him, MacPhail was an oracle who saw how baseball could survive, and even flourish, in a changing world. Larry MacPhail got in people's faces. He wore flashy clothes and drank heavily. His swiftly changing moods made him difficult if not impossible to comprehend. He would fire Leo Durocher, his manager in Brooklyn, one day only to rehire him the next. Many thought he verged on insanity. Leland Stanford MacPhail was born in Cass City, Michigan, on February 3, 1890. His father, William Curtis McPhail, a Scottish immigrant, was a prosperous storekeeper and banker. MacPhail, who later changed the spelling of his surname to emphasize his Scottish heritage, got his first name because his mother, Catherine Ann (MacMurtrie) McPhail, was a close friend of Mrs. Jane Lathrop Stanford, the wife of Leland Stanford, the famous railroad builder, governor and senator from California, and founder of Stanford University. At the age of sixteen and recently graduated from Staunton Military Academy, MacPhail was accepted at the U.S. Naval Academy but instead went to Beloit College in Wisconsin. At Beloit he played baseball and was a halfback on the football team. Later he attended the University of Michigan, and George Washington University in Washington, D.C., emerging with a law degree at age twenty. He practiced law in Chicago and later headed up a department store in Nashville, Tennessee. MacPhail married Inez Thompson of Oak Park, Illinois, on October 19, 1910, and had three children with her: Leland Jr., William, and Marian. William was a television executive, Marian was the head of research at Time magazine, and Lee MacPhail became a baseball executive who was elected to the Baseball Hall of Fame in 1998, twenty years after his father’s election. For Inez, life as the wife of a baseball executive and the 1938 move of the family from Columbus to Larchmont, New York, left her feeling alone and deprived of her Ohio friends. They separated in 1939 and were divorced in May 1945. When America entered the World War, in 1917, MacPhail enlisted in the Army as a private, rose to the rank of captain and was wounded fighting in France. At the end of the war MacPhail, his commanding officer, Colonel Luke Lea, a former U.S. Senator from Tennessee, and several others tried to kidnap the former German emperor, Kaiser Wilhelm II, who was living in exile in Holland. They almost were imprisoned themselves as they were unsuccessful in the attempt and barely got out with their lives. After being discharged from the Army, MacPhail refereed Big Ten football games and toyed with various ventures, most of which were unsuccessful. In 1930 he acquired an option to buy the Columbus (Ohio) Red Birds baseball team, which was failing financially. MacPhail brokered the sale of the club to Branch Rickey, and Columbus became part of the St. Louis Cardinals farm system, with MacPhail as president of the club. Through his entrepreneurial farsightedness and boldness, MacPhail brought the ailing Columbus team back to financial stability. He had a new stadium built and introduced three-dollar Ladies Day season tickets. He organized a knothole gang and also had lights installed. In 1932 the Columbus team outdrew the parent Cardinals 310,000 to 279,000. But MacPhail's insistence on putting the welfare of the Columbus team ahead of the parent team caused the first of his many rifts with Rickey, as they argued over the makeup of the Columbus and St. Louis rosters. The personalities and lifestyles of MacPhail and Rickey made it highly unlikely they would ever get along. Rickey was an abstemious, churchgoing person; MacPhail was a drinker, a flashy dresser, and a loudmouth. Cincinnati offered MacPhail a way out from under Rickey. Sidney Weil, president and director of the Reds, retired in 1933 and turned his stock over to the Central Trust Company in Cincinnati. In 1934 Powel Crosley Jr., the owner of radio manufacturing plants and radio stations, bought the team and wanted Rickey to run it. Rickey did not want to leave St. Louis, but suggested MacPhail. As vice president and general manager of the Reds, MacPhail soon brought winning baseball back to Cincinnati. He put in lights at Crosley Field and set about building a team that helped pave the way for pennant winners in 1939 and 1940 and a World Series championship in 1940. Nocturnal baseball in the major leagues (the minor leagues had been playing under lights for some time) began on May 24, 1935. At 8:30 P.M. President Franklin D. Roosevelt pushed a button in the White House, signaling MacPhail to turn on the lights at Crosley Field. The ballplayers' reaction to night baseball was positive. There had been some speculation that under lights only the top side of the ball would be visible; this was not the case, and most everyone was quite satisfied with the game, which was viewed by more than 25,000 fans. The Reds defeated the Phillies, 2–1. Embroiled in controversy, however, MacPhail left at the end of the 1937 season before the Reds had success. Crosley was displeased with MacPhail's altercations with the police, fueled by his heavy drinking. 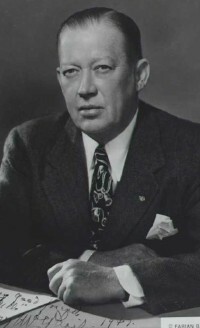 MacPhail departed and spent the rest of 1937 in the banking business in Michigan. In 1938 MacPhail received a call from the Brooklyn Trust Company to come to Brooklyn and bail out the team that was in dire financial straits. MacPhail answered the call and put the Dodgers back into contention. MacPhail realized that average working men and women could rarely go to a ball game in the afternoon. He began night baseball at Ebbets Field as a means of increasing attendance and profits at the box office. Also, at Brooklyn in his first year he hired Babe Ruth as a coach and tried out a lemon yellow ball; neither of these experiments helped much. However, it was his clever trading ability that really counted. In March 1938 he got slugging first baseman Dolph Camilli from the Phillies and in October secured pitcher Hugh Casey in the Rule 5 draft. In 1939 he hired Leo Durocher as manager, claimed Dixie Walker on waivers, and brought in Red Barber to call the games on radio. Barber, whom MacPhail had first hired in Cincinnati, had a soothing Southern voice that taught many a housewife and young boys and girls the intricacies of baseball. At first many club owners were leery of broadcasting games but they soon found that it brought more fans to the ballpark. Dodgers’ attendance soared in 1939; they outdrew the mighty Yankees by almost 100,000 and the Giants by more than 250,000. In 1940 MacPhail added rookie Pee Wee Reese at shortstop and acquired outfielder Joe Medwick and pitcher Curt Davis in a trade with St. Louis. Pete Reiser plucked out of the St. Louis farm system in 1938 also made his big league debut. Rickey had asked MacPhail to sign Reiser and keep him out of sight in the low minors until 1940, when he could be traded back to the Cardinals. But Reiser sparkled to spring training with the Dodgers in 1940, and Durocher, unaware of the deal with Rickey, started playing him in exhibition games. MacPhail sent a wire to Durocher, "DO NOT PLAY REISER AGAIN." When Durocher inserted Reiser into the lineup in a game in Macon, Georgia, MacPhail called him to his hotel room, cursed him, and fired him. The angry Durocher shoved MacPhail, who fell over the bed in a somersault, got up, and, as if by magic, had a change of heart. He put his arm around Leo and told him he was still the manager, then calmly went on to say that Reiser should be optioned to Elmira so that he could further develop his talent. On June 18 Medwick was struck on the temple by a pitch thrown by the Cardinals’ Bob Bowman and suffered a severe concussion. MacPhail demanded that National League president Ford Frick bar Bowman from baseball, but cooled down as Medwick missed only three games. In the aftermath of the incident, MacPhail and Dr. George Eli Bennett, a professor of orthopedic surgery at the Johns Hopkins School of Medicine in Baltimore, devised one of the earliest protective helmets for players. MacPhail was back in the Army during World War II, doing public relations work for the War Department. His old mentor and sometime foe, Branch Rickey, replaced him at Brooklyn. Commissioner Landis died in November 1944. MacPhail attended meetings in February 1945 to elect a new commissioner and promoted Albert "Happy" Chandler, a United States senator from Kentucky, to succeed Landis. Chandler was elected commissioner in April. In 1943, after Jacob Ruppert, owner of the Yankees, died, the team was put up for sale. MacPhail had assembled a syndicate to bid on the team, but Judge Landis squelched any deal because one of the members of the syndicate owned racehorses. The pressure to sell the team to pay estate taxes grew, and MacPhail stepped up again. With two other members of his original syndicate, Dan Topping, a wealthy sportsman who owned the Brooklyn Dodgers of the National Football League, and Del Webb, an Arizonan who ran construction and real estate ventures, MacPhail proffered a successful bid in January 1945. MacPhail took over as the team’s president after he was discharged from the Army in February 1945. Also in 1945, a week after his divorce from Inez, MacPhail married Brooklyn-born Jean Bennett Wanamaker, who had been his secretary when he was with the Dodgers. As with Durocher, he had fired and rehired her several times. The couple had one daughter, Jean, born in 1950. Almost immediately the Yankees’ businesslike operation took a reverse course. MacPhail’s tempestuous side was in such full swing that three managers quit on him in 1946: Joe McCarthy, Bill Dickey, and Johnny Neun. Major league baseball had to deal with some labor problems in 1946. Chandler banned several ballplayers who had signed contracts to play with the Mexican League. Also, Robert Murphy, a labor lawyer, tried to organize a players union. MacPhail headed an owners committee that agreed to set a minimum salary of $5,000; institute a modest pension plan; give players a $25-a-week allowance during spring training (still called Murphy money); and give the players formal representation on a council with the owners and the league presidents. These were small concessions; the ballplayers would have to wait many years before free agency and greater bargaining power came their way. MacPhail and Durocher's brashness embroiled them in an uproar during spring training in 1947 that had serious consequences. Durocher, still managing the Dodgers and under heavy criticism for fighting with fans and umpires, was also under attack for his life away from the ball field. At a spring-training game in Havana he pointed to some well-known gamblers who appeared to be in a box seat with MacPhail and said, "If that was my box I'd be barred from baseball." Actually, the gamblers were not sitting in the same box as MacPhail; they were in a box behind him. Hearing of Durocher's remark, MacPhail demanded that Commissioner Chandler do something about it. Chandler held two hearings, and on April 9, just before the season was to open, he suspended Durocher from baseball for one year—for actions other than the Havana incident. This suspension resulted in outcries from fans, and even some owners, who felt Durocher had been unfairly punished. Many felt that this harsh treatment was a political payback to MacPhail for his aid in getting the Commissioner’s job for Chandler. The Yankees won the pennant and the World Series in 1947. MacPhail was ecstatic. As Branch Rickey left the field, MacPhail caught up with the disconsolate Rickey, putting his arm around his shoulder, offering his hand, and starting to congratulate him on the fine job he had done with the Dodgers. Rickey cut him short. “I am taking your hand only because people are watching us,” he said. Rickey launched into reasons for his disappointment in MacPhail as a man, and ended their relationship once and for all: "Don't you ever speak to me again." MacPhail's elation turned to deep anger as he entered the Yankees' clubhouse. Following the "Battle of the Biltmore," MacPhail and baseball were finished with each other. Possibly seeking a more placid life, he bought a farm near the Bowie Racetrack in Maryland that he called Glenangus, and where he raised Black Angus cattle and bred racehorses. He became president of the racetrack during his retirement, but sold the farm when it ran into financial troubles. MacPhail had his first battle with cancer in 1952. Informed that he might have cancer of the throat, he asked the opinions of several doctors, some affirmed the diagnosis while others rejected it. But MacPhail was not satisfied with the answers and sought the opinion of his daughter Marian's husband, Dr. Walsh McDermott, who confirmed the diagnosis as cancer of the larynx and suggested immediate surgery. The operation was a success, but MacPhail was diagnosed with cancer of the intestines in 1957, and again had life-saving surgery. MacPhail's last years were sad. The ravages of alcohol and the onset of what is now presumed to be Alzheimer's disease were affecting his once great entrepreneurial mind. He was failing psychologically and physically. His children wanted to put him into a private institution, but he insisted on going to a veterans hospital, as if he wanted to recapture the past when he was an officer in both World Wars. He was obstreperous with the staff and to the very end true to his nature as the Roaring Redhead. MacPhail died on October 1, 1975, at the age of eighty-five, in the Jackson Manor Nursing home in Miami, Florida. Surviving were his wife, Jean, sons Bill and Lee, and daughters Jean MacPhail and Marian McDermott. He is buried in Cass City. Whatever his shortcomings, MacPhail was a major contributor to baseball. For seventeen years his almost manic energy and farsightedness carried him far beyond the innate conservatism of Major League baseball in his time. He was a baseball maverick at a time when his fellow executives were satisfied with the status quo. He played a vital role in baseball enduring the difficult times in which he operated. MacPhail’s contributions to the game earned him election to the Hall of Fame in 1978, three years after his death. Three generations of MacPhails became baseball executives. Son Lee was instrumental in continuing the Yankee dynasty into the 1950s, building the great Baltimore Orioles teams of the 1960s, and he also served as president of the American League; he was elected to the Hall of Fame in 1998. Grandson Andy was general manager of the 1987 world champion Minnesota Twins and later was president and general manager of the Chicago Cubs and Baltimore Orioles. None inherited Larry's instability. Barber, Red. 1947 – When All Hell Broke Loose in Baseball. New York: Doubleday, 1982. Karst, Gene. "MacPhail, Leland Stanford, Sr. 'Larry.'" In David L. Porter. Biographical Dictionary of American Sports – Baseball. New York: Greenwood Press, 1987. Koppett, Leonard. Koppett's Concise History of Major League Baseball. New York: Carroll and Graf, 2004. McKelvey, G. Richard. "Larry MacPhail." Scribner Encyclopedia of American Lives, Thematic Series: The 1960s. Ed. William L. O'Neill and Kenneth T. Jackson. New York: Charles Scribner's Sons, 2002. Gale Biography In Context. Web. 3 Dec. 2011. Light Jonathan Fraser. The Cultural Encyclopedia of Baseball. Jefferson, North Carolina: McFarland, 1997. McKelvey, G. Richard. The MacPhails, Baseball's First Family of the Front Office. Jefferson, North Carolina: McFarland, 2000. Rader, Benjamin G. Baseball: A History of America's Game. Chicago: University of Illinois Press, 1992. Warfield, Don. The Roaring Redhead. South Bend: Diamond Communications, 1987. White, G. Edward. The National Pastime. Princeton: Princeton University Press, 1996. Durso, Joseph. “Baseball’s Larry MacPhail Dies; Started Night Games, Led Yanks.” New York Times, October 2, 1975. Holland, Gerald. "The Great MacPhail." Sports Illustrated, August 17-31, 1958, 62-68, 62-68, 58-64. "Landis, Kenesaw Mountain." Obituary. New York Times. November 26, 1944. “Powel Crosley Jr. Is Dead at 74; Owner of the Cincinnati Reds.” New York Times, March 29, 1961. Telephone conversations between Tom Bourke and Mrs. Jean Duncan, Larry MacPhail’s daughter, on October 22 and 23, 2011. 1. Rom Fimrite, “The Play That Beat the Bums,” Sports Illustrated, October 20, 1997.